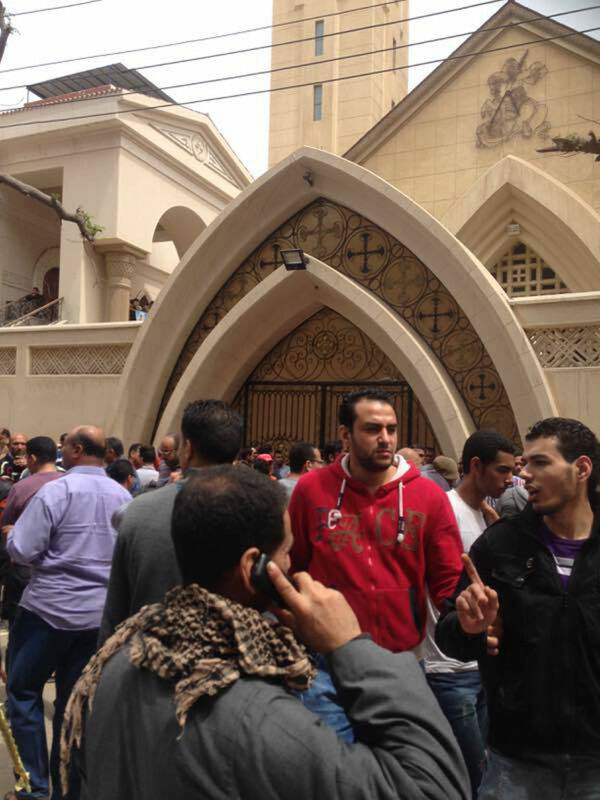 TANTA, Egypt (AP) — Bombs tore through two Egyptian churches in different cities as worshippers were marking Palm Sunday, killing at least 37 people and wounding around 100 in an assault claimed by the Islamic State group. In the first, attack, a bomb exploded at Saint George church in the Nile Delta city of Tanta, killing at least 26 people and wounding over 70, officials said. Later, an explosion hit Saint Mark’s Cathedral in the coastal city of Alexandria, the historic seat of Christendom in Egypt, killing at least 11 people and wounding 35 just after Pope Tawadros II finished services. His aides later told local media that he had escaped unharmed. IS claimed the attacks via its Aamaq news agency, after having recently warned that it would step up attacks on Egypt’s Christians. The blasts came at the start of Holy Week leading up to Easter, and just weeks before Pope Francis is due to visit the Arab world’s most populous country. CBC TV showed footage from inside the church in Tanta, where a large number of people gathered around what appeared to be lifeless, bloody bodies covered with papers. Regional Deputy Health Minister Mohammed Sharshar confirmed the toll. Across the street, neighbor Susan Mikhail, whose apartment has a clear balcony view of the church and its front yard, said the explosion violently shook her building midmorning, at a time when the church was packed. “Deacons were the first to run out of the church. Many of them had blood on their white robes,” she told The Associated Press. Later, the more seriously wounded started to come out, carried in the arms of survivors and ferried to hospitals in private cars, she said. Pope Francis decried the bombings, expressing “deep condolences to my brother, Pope Tawadros II, the Coptic church and all of the dear Egyptian nation.” Word of the attacks came as Francis himself was marking Palm Sunday in St. Peter’s Square. Both Israel and the Islamic Hamas movement ruling neighboring Gaza also condemned the bombings. The bombings add to fears that Islamic extremists who have long been battling security forces in the Sinai Peninsula are shifting their focus to civilians. An Islamic State affiliate claimed a suicide bombing at a Cairo church in December that killed around 30 people, mostly women, as well as a string of killings in the restive northern Sinai that caused hundreds of Christians to flee to safer areas of the country. The group recently released a video vowing to step up attacks against Christians, who it describes as “infidels” empowering the West against Muslims. Egypt has struggled to combat a wave of Islamic militancy since the 2013 military overthrow of an elected Islamist president. The Sinai-based IS affiliate has mainly attacked police and soldiers, but has also claimed bombings that killed civilians, including the downing of a Russian passenger plane over the Sinai in 2015, which killed all 224 people on board and devastated Egypt’s tourism industry. Egypt’s Copts are one of the oldest Christian communities in the Middle East. They have long complained of discrimination and that the government does not do enough to protect them. Egyptian media had previously reported that the church in Tanta had been targeted in the past, with a bomb defused there in late March. The Copts were largely supportive of the military overthrow of Islamist President Mohammed Morsi, and incurred the wrath of many Islamists, who attacked churches and other Christian institutions after his ouster. Written by HAMZA HENDAWI, Associated Press. AP writers Maamoun Youssef and Maggie Michael in Cairo and Bassem Mroue in Beirut contributed to this report.